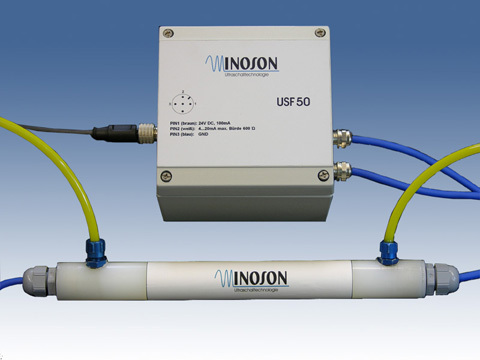 The USF50 captures the flow volume or the current speed of gases in thin pipelines and tubes. 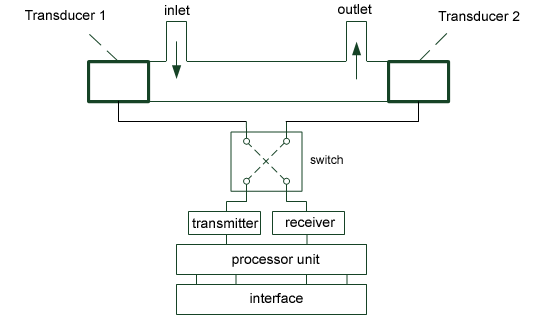 The sensors are planned as a component for the integration in machines and devices. They can be inserted very simply mechanically and be integrated electrically into the control. No installations, no pressure loss, without wear: In the tube system no installations or narrowing are necessary. These would lead to an appreciable pressure loss and with it to measuring mistakes. Because the measuring cell shows no movable parts, no wear exists in the sensor practically. Independence of the medium: The measuring procedure is independent regardless of temperature, colour and electromagnetic qualities of the gas. With it the procedure is suited without new calibration for a huge number of gases or areas of application. Nevertheless, if necessary temperature gradients or density differences are to be considered in the gas. Quickly: On account of the quick time measurement the measuring procedure works nearly freely of delay and is with it to turbine meter or thermal procedures clearly consider. Also pulsating currents can be measured. You receive further information underr info@inoson.de.